Preheat the oven to 200˚C, 180˚C fan, gas mark 6. Bake the potato for 1hr – 1hr 20mins until tender. If you’re time-pressed, ping your potato in the microwave for five minutes to soften it up, then finish in the oven for 35-40 minutes. Cool enough to handle, then cut the baked potato in half. Use a spoon to scoop out the flesh and place in a small bowl. Using a fork mask the potato flesh and add the butter, 30g of grated Applewood® and season to taste. 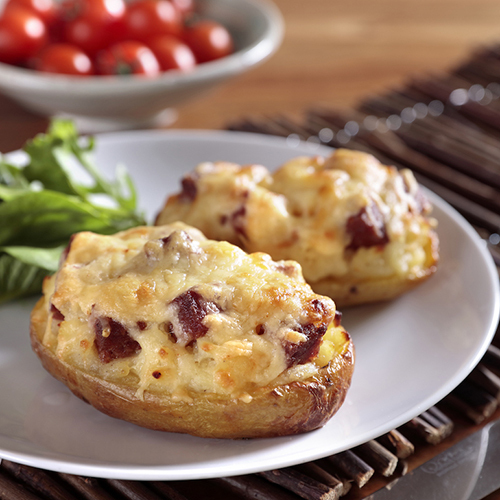 Stir in the cubed corn beef and pile the filling into the two potato skins. Place on a baking sheet and sprinkle over the remaining grated Applewood®. Pop the loaded skins back into the oven for 10 more minutes until the cheese is bubbling and golden and the filling is piping hot.